Connected riding™, a method created by Peggy Cummings, is inspired by the most recognized pioneers of self-awareness, such as Sally Swift, Linda Tellington-Jones, Feldenkrais, Alexander, and martial arts. We learn to connect both through awareness of our own body and position and then by knowing how to listen to the body of the horse. Without this knowledge, without any awareness of how to apply it, riding creates tension in different parts of the horse’s body, because the movement won’t flow freely through the horse. This makes the rider work harder to create a forward movement. Often the effort becomes unbalanced, because the horse must compensate for what is lacking in the rider. This vicious circle of tension between rider and horse damages elasticity; the ability to rebalance is lost, so the rider must exert extra effort, and the horse loses its ease of movement as well as its desire to cooperate. Connected Riding™ teaches how it is possible to ride the horse, to be synchronized with the horse’s movement, based upon knowledge of both our own and the horse’s biomechanics. Visit the of Peggy Cumings’ Connected Riding™ website here. The classes are for experienced riders from the age of 12 . Horseway has internships available for interested students and adults throughout the year. 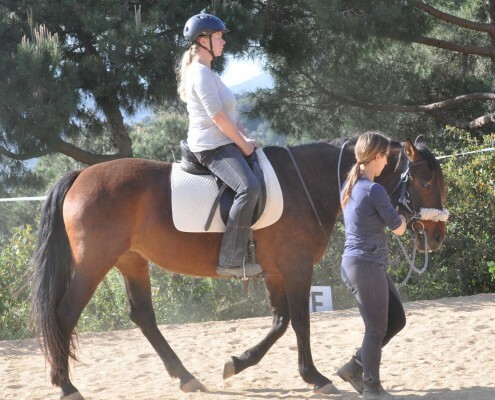 This stages provide with hands on experience in all aspects of the Connected Riding method, both Groundwork and Riding and also can be blended with Natural Taming (equine education) lessons. Which are the benefits of Connected Riding? 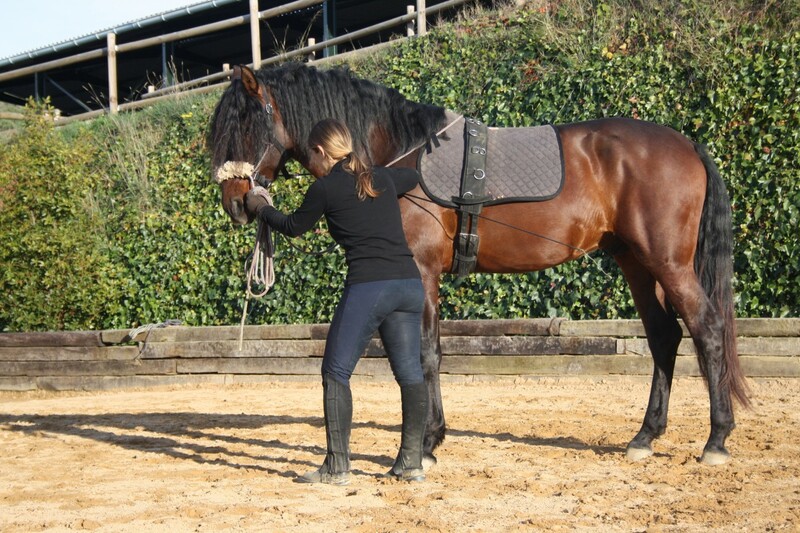 The method is based on work with the rider to become aware of how the riding position affects the horse and teach him to comfortably support the rider’s weight. 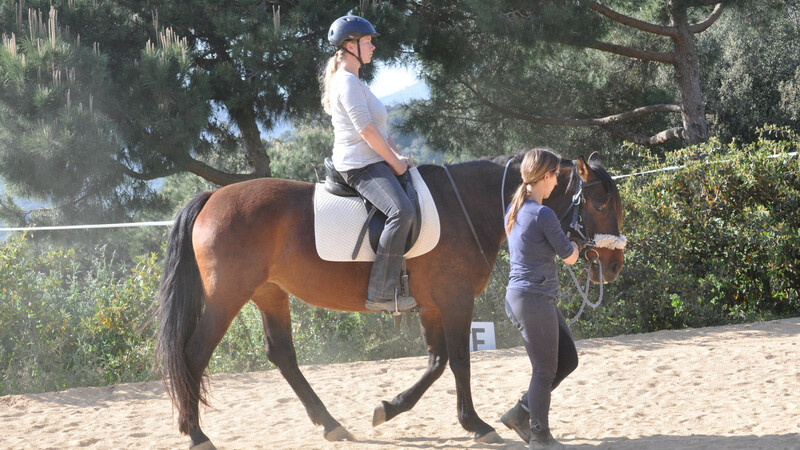 Learning how to ride in the correct position, and with the proper help, allows the connection with the horse. We sense the movements of the rear legs traveling up through our bodies, being transmitted through our arms, through the reins, to the back, the neck, and the head of the horse. This movement travels back to the body of the horse, and the cycle repeats. This is how the energy flows. 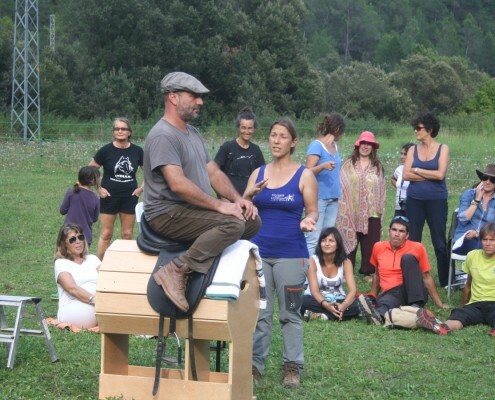 influencing the movement of the horse in an easy, simple way, adapting harmoniously with their movement. learning to ride without bodily tension, which reduces stress to the joints and muscles. riding with less effort because of deeper bodily awareness, for greater balance and safety. working dismounted from the horse teaches it the correct posture to support the rider’s weight comfortably and educates its body to move more freely, with which we get greater balance and impulse from the back legs. helping the horses re-pattern bodily habits that can cause tension, pain and injuries. Teaching the rider body and movement awareness; teaching the best position to ride the horse, and teaching how to move in harmony with the horse. Teaching the horse to develop postural, muscular, and movement patterns, to gain balance, and to support, without pain nor tension, the weight of the rider. The rider needs to know correct posture, both mounted and dismounted, to be the horse’s perfect dance partner, following its movement. We teach riders to mount the horse from the interior (by sensation) to the exterior (by action). We learn bodily awareness by exercising without the horse. We learn about our own body, how to move, how to be able to direct, with fluidity and harmony, our dance with the horse. We must know when we are in the neutral pelvis position in the first place, and we must remember to recover it consistently. In this position, the central muscles of our torso, abdominal and dorsal, keep our bodies naturally straight. When the rider keeps the neutral pelvis position, those muscles maintain our balance with more security and stability in any type of situation, such as when something frightens or startles the horse. When we can respond without tension when emergent, compromising situations with the horse arise, physically or mentally, we confirm that clear communication that generates even more trust and reciprocity. being open to change when something is not working. 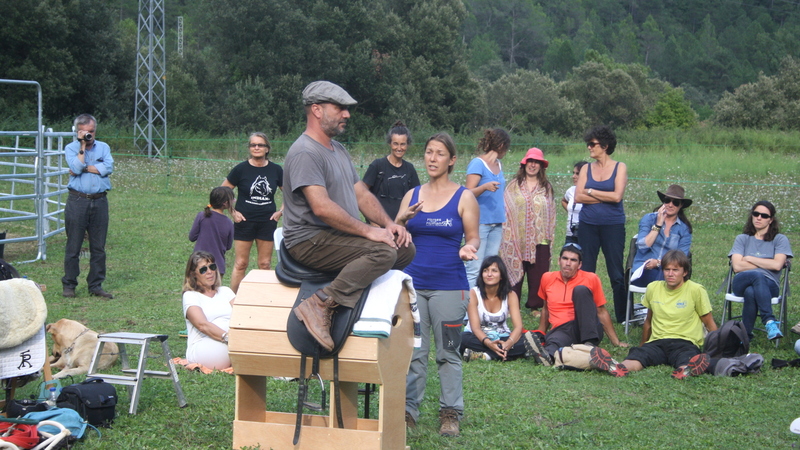 All Connected riding classes and courses are thaught by Melín M. Farriols, equine educator and oficially the only practitioner of Connected Riding™ in Spain. giving orders into kindly asking. Using our body more efficiently improves our horse’s performance, so both horse and rider can enjoy the ride in a harmonious way. 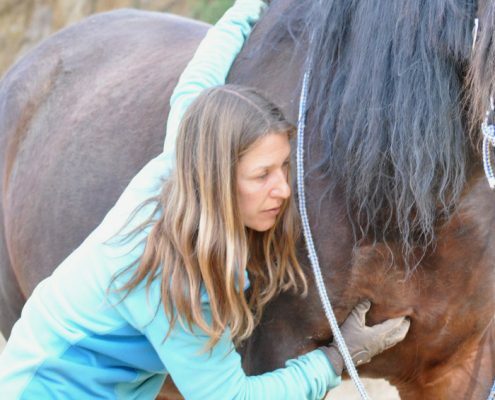 With this connection we sense the movements of the rear legs traveling up through our bodies, being transmitted through our arms, through the reins, to the back, the neck, and the the cycle repeats. This is how the energy flows. Come, experiment! Forget expressions like: my horse is stupid, my horse is stubborn, my horse doesn’t listen. We teach our horses correct posture for being ridden, even though they are not born with this instinct. Our teaching is always based on an understanding of what is happening, avoiding confrontation, and focusing on teaching the horse to learn to think instead of merely reacting. Some horses are born with bad postural habits, some have bad habits because of their morphology, and others because they weren’t adequately handled from the beginning. Many horses become more rigid year after year, even though they are well cared for, because sometimes we may unwittingly contribute to patterns of tension and pain in the horses. 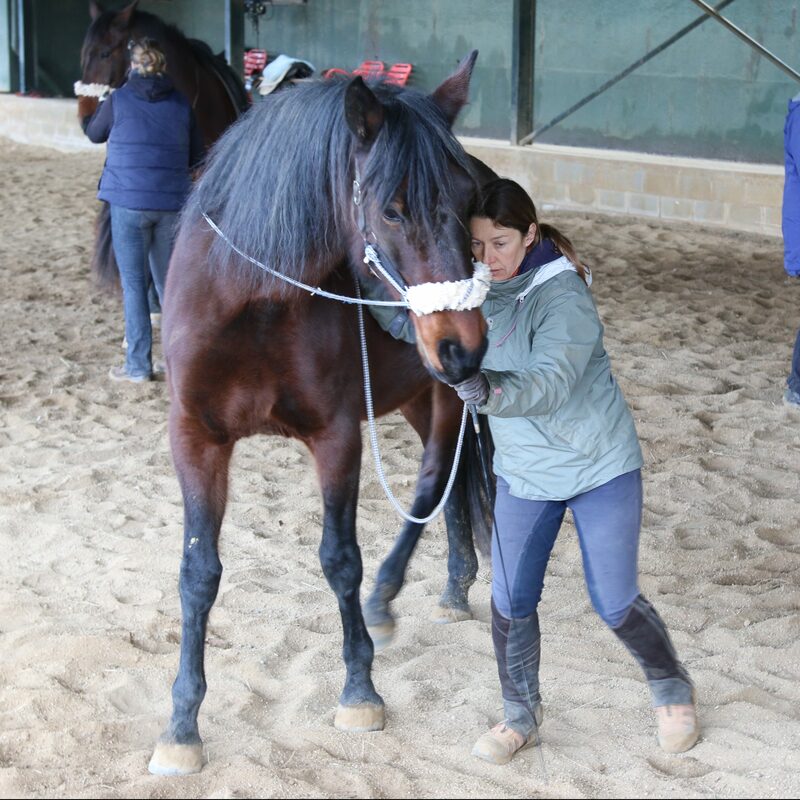 The main objective of the groundwork is to learn how to teach horses to adopt the correct posture for carrying a rider more comfortably, the weight bearing posture. It is essential that horses learn to carry themselves in the best position —balanced, relaxed and flexible. This helps reduce rigidness and tension, biomechanically preparing the horse to carry the rider’s weight.